American Jew reported missing after Taliban terrorists attack Kabul hotel. An American Jewish man has been reported missing, following a terrorist attack on a hotel in the Afghani capital city of Kabul over the weekend. 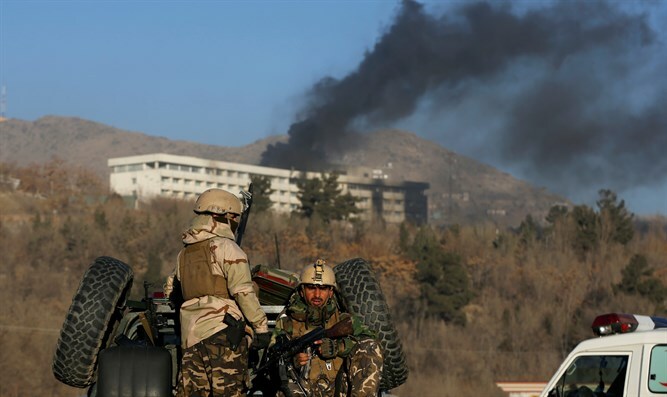 At approximately 9:00 p.m. local time Saturday night, terrorists wearing army uniforms and armed with automatic weapons and rocket-propelled grenades seized the entrance to the Intercontinental Hotel in Kabul. The siege lasted more than 12 hours, before Afghani security personnel were able to secure the hotel. According to the BBC, at least 22 people were confirmed dead in the attack, though the local Tolo News outlet put the figure at 43. While some 160 people, including 150 guests, were rescued from the hotel, at least 14 foreigners were killed in the attack. The foreign victims of the attack have been identified as a nine Ukrainian nationals, a German citizen, a Greek national, and a citizen of Kazakhstan, the BBC reported. Two others have yet to be identified. Eleven of the 14 foreign nationals killed are believed to be employees of KamAir, a private Afghani airline company. The attack comes on the heels of a suicide bombing in Kabul on December 28th which left at least 41 dead and more than 80 others injured. Following the attack, relatives of an American Jewish man have reported that they have been unable to confirm his whereabouts. According to a report by Behadrei Haredim, the missing man, identified only by his first name, Elyakim, is a graduate of Yeshiva Gedolah Ateres Mordechai in Oak Park, Michigan. The missing man, who is said to be in his mid-50s, has not been in contact with his family in the US in the past four days.